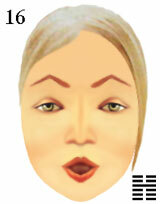 Gallery of emotions for female facial images. It is necessary in gallery to choose physiognomic symbols which are comparable to emotions of a woman and can be considered as template images for cosmetic make-up even if facial features look as sad, and then female face will be attractive and beautiful. Joyful eyes seem cordial as eyebrows and mouth express open emotions. The open eyebrows and mouth seem happy as eyes express joyful emotions. The pleasure happiness is realized by reason, and the person does not hide outspoken feelings. Open feelings admire ideas and show desires of the person. symbols of emotions for attractive facial images in gallery.